Replies: 19 (Who? ), Viewed: 10600 times. #1 27th May 2014 at 10:41 PM Last edited by SheGamerReloaded : 29th May 2014 at 3:54 PM. I created this challenge because it was something new and it was best for the Sims 2 since there aren't any challenges like this for the Sims 2....Enjoy !! To watch me play this challenge..Click Here . The game is completed when you get to 10 generations with the same founder then you count up all of your points. - You can only woohoo or have children with your partner if you're married to them. - The partner of the founder has to die of old age ONLY, NO CHEATS to cause death. you also CAN'T command the partner to do something you know that may cause death [E.g. fixing computers/TV with no mechanical skill causing them to get shocked]. - You can only start seeking for a new partner once the old partner is dead. - The only way to keep the founder alive and young is by drinking the Elixir of Life and NOTHING ELSE. No cheats or mods to stop aging [Includes turning aging off in the game]. - The Elixir of Life would only be available by getting enough aspiration points for the founder. - You CAN'T buy the Elixir of Life with points from any one else in the family, but the founder. - You CAN'T use the 'boolprop' cheat to get their aspirations high. You CAN'T use any other cheats in this game, you have to work for everything. - NO ONE else but the founder can drink the Elixir of Life, you also CAN'T use the Elixir of Life on the partner for them to live longer so you can have more children and get more points. - The children can ONLY age up naturally or when they are able to be 'brought to cake' and NOTHING ELSE. - You CAN'T use potions from witches or download custom content that will affect age, but you can have other custom content in the game. Oooh, i like it. Very well thought out. I'll definitely try this out sometime! Edit: Only thing I would add it making the challenge have negative points for anyone else using their aspiration points to buy the elixir of life. Also no cowplant? Yeah that's a great idea but its against the rules to use points for the Elixir of life from anyone else but the founder. What does the cowplant do? #4 29th May 2014 at 12:27 AM Last edited by AriTheWise : 29th May 2014 at 3:40 AM. Whoops, sorry. I guess I skipped over the elixir rule. 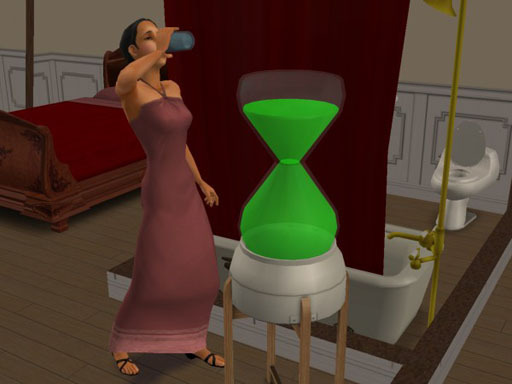 If the cowplant eats someone, a sim can milk it to similar effects of the elixir. It extends life by 5 days. . Sounds like an interesting way to populate a new hood my only caveat is you have written "move grave off lot or delete headstone to prevent ghosts". This is a VBT, deleting graves will bork your hood...maybe edit it to just move graves off lot. Children & toddlers with long-term wants other than Grow Up. Wants that don't fit the age group (e.g. a toddler who suddenly wants to go on a date). Memories & thought bubbles that contain squiggly lines. Memories being lost or totally random. Sims losing family members in their family tree. Graves are sims. Deleting a tombstone or urn is the same as deleting a sim, and causes the same kinds of corruption. If a grave or urn is smashed by another sim and you do not have Pescado's No Unlink on Delete hack installed, quit without saving. Deleting a Sim does not completely remove all of it's data, and it will corrupt your hood up in the long run. I can't explain it more as I am not the best at explaining, but I did try. I'd check out the thread, but if nothing is wrong I wouldn't worry for now. However, if you do get any symptoms you should probably check through the game FAQ's, game problems etc. You will probably have to reinstall if worst comes to worst. But you'll most likely be fine. SheGamerReloaded, the best thing you can do is install the following mod: http://www.moreawesomethanyou.com/s...hp?topic=2083.0 (nounlinkondelete) It will make sure your neighborhood doesn't get corrupted if you accidentally delete a gravestone. 1) What happens when your founder becomes permaplat? 2) What happens when your partner accidentally dies (I mean, I don't want to keep them from cooking or having trees)? Game over? 2) Do you get +20 per generation with three children or do you get +200 if every generation has three children? 1) What is a Permaplat? Permaplat is when you fulfill your life time want and or with Free Time EP you can gain permaplat by doing or fulfilling wants. This rule here: "40+ Every time you buy the Elixir of Life with the FOUNDERS aspiration points"
I can have my sim get this 2-4 times each day by having them do a great date. I will have 100 partners and i will try to have 1000 childrens! Question: No moving your kids out when they become adults? This implies that not only can kids move out upon reaching adulthood, but so can teens (if one plays with an appropriate mod). "- You CAN'T play any other relatives household but the founders." Does this mean that I can't use the children from the Immortal Challenge in other challenges? I really love this challenge! Probably not going to do this on Youtube, but I might do it as a blog challenge! I'm definitely going to do it right now! I hope I can do this right without failing the game :P.
This message has been deleted by Mirantia. Reason: blog is no longer there. I'm not a blogger.